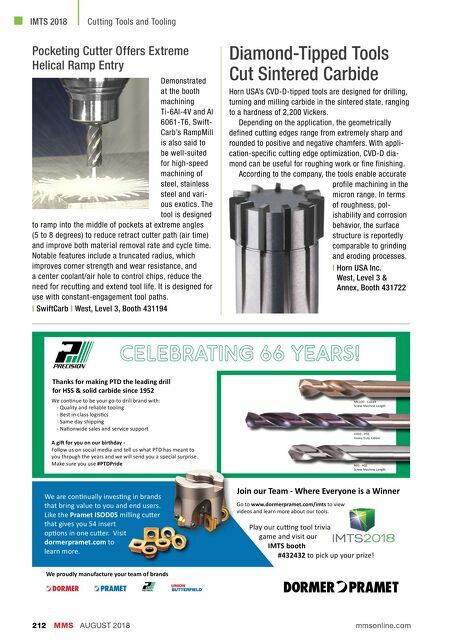 MMS AUGUST 2018 212 mmsonline.com IMTS 2018 Cutting Tools and Tooling Pocketing Cutter Offers Extreme Helical Ramp Entry Demonstrated at the booth machining Ti-6Al-4V and Al 6061-T6, Swift- Carb's RampMill is also said to be well-suited for high-speed machining of steel, stainless steel and vari- ous exotics. The tool is designed to ramp into the middle of pockets at extreme angles (5 to 8 degrees) to reduce retract cutter path (air time) and improve both material removal rate and cycle time. Notable features include a truncated radius, which improves corner strength and wear resistance, and a center coolant/air hole to control chips, reduce the need for recutting and extend tool life. It is designed for use with constant-engagement tool paths. | SwiftCarb | West, Level 3, Booth 431194 Diamond-Tipped Tools Cut Sintered Carbide Horn USA's CVD-D-tipped tools are designed for drilling, turning and milling carbide in the sintered state, ranging to a hardness of 2,200 Vickers. Depending on the application, the geometrically defined cutting edges range from extremely sharp and rounded to positive and negative chamfers. With appli- cation-specific cutting edge optimization, CVD-D dia- mond can be useful for roughing work or fine finishing. According to the company, the tools enable accurate profile machining in the micron range. In terms of roughness, pol- ishability and corrosion behavior, the surface structure is reportedly comparable to grinding and eroding processes. | Horn USA Inc. West, Level 3 & Annex, Booth 431722 We proudly manufacture your team of brands Thanks for making PTD the leading drill for HSS & solid carbide since 1952 We conƟnue to be your go-to drill brand with: - Quality and reliable tooling - Best in class logisƟcs - Same day shipping - NaƟonwide sales and service support A giŌ for you on our birthday - Follow us on social media and tell us what PTD has meant to you through the years and we will send you a special surprise. 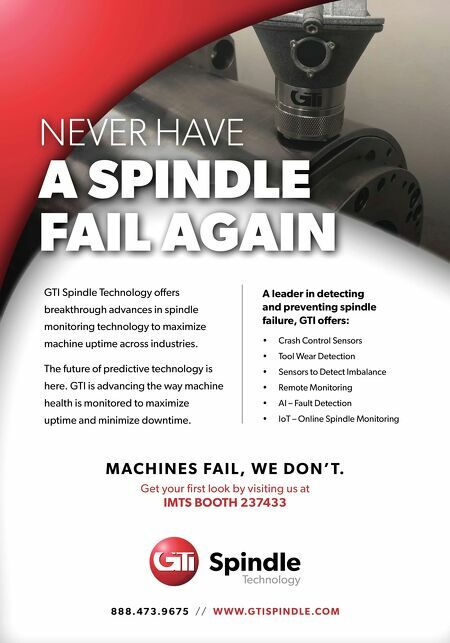 Make sure you use #PTDPride Join our Team - Where Everyone is a Winner Go to www.dormerpramet.com/imts to view videos and learn more about our tools. Play our cuƫng tool trivia game and visit our IMTS booth #432432 to pick up your prize! HX10 - HSS Heavy Duty Jobber M41CO - Cobalt Screw Machine Length R40 - HSS Screw Machine Length We are conƟnually invesƟng in brands that bring value to you and end users. Like the Pramet ISOD05 milling cuƩer that gives you 54 insert opƟons in one cuƩer. Visit dormerpramet.com to learn more.